Three years ago today we got married. 1095 days. 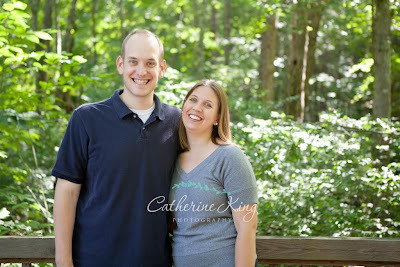 I cannot believe we have been married for that long, although I could also say that it's only been that long?!?! My wedding day was the best day of my life. Every. Thing. Was. Perfect. No kidding. I know most people say that but it was exactly the way we dreamed. You can read more about it here, here, here and here. We have pretty opposite personalities but some how we just fit together. At times we are that old married couple that can sit next to each other in silence and are completely content. 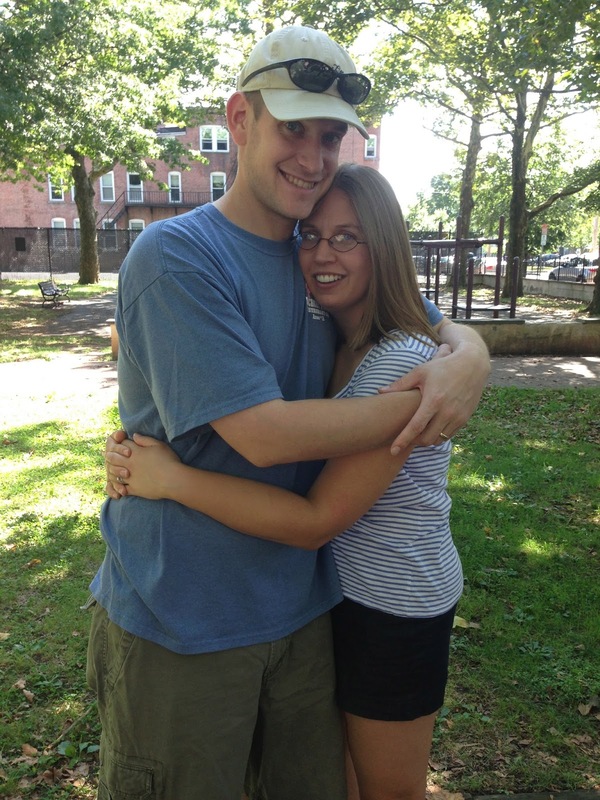 As a married couple we have lived in two different states and are about to make one last move for a while. Home-ownership will bring about many changes. Our house is going to keep up busy for a long time to come. We are celebrating quietly tonight with a dinner out and just enjoying each others company. I am not sure it can get much better than it is for us right now. Thanks for letting me be a bit sentimental today. Life goes on for me. Nothing too exciting to note. I am trying to enjoy every last bit of summer eats. Berries on everything. This is most easily done with cereal in the morning. Love blueberries on cereal. I think I might have more fruit than cereal in this bowl. Sunday with the in-laws we went out to celebrate our upcoming wedding anniversary. We went to a local restaurant we love. I had this Burrata salad. I cannot get it out of my mind. It was so good. For lunch I tried to recreate it with fresh mozzarella. It wasn't the same but really good all in all. Tomatoes are at their prime right now in my garden. Dinner was a new recipe I was looking forward to making for a while. Sloppy turkey bacon cheese burgers. Big enough title for you? The photo is not very attractive but these were pretty good. I had touching raw meat. For this recipe I just kind of dumped the turkey package in the pan. No touching but still burger-esque. They were delicious on some fresh bread from the bakery next door. Have you ever had Burrata cheese? You know that chicken dinner post from yesterday? Well this is the slaw recipe we used. It was ah-mazing. I am not a fan of Cole slaw. Mayonnaise kills me. Seriousness. Right here. I avoid anything and everything that might possibly have mayonnaise in it. Nobody wants me dying. But this recipe. No mayonnaise. Not even replacement yogurt in the mix. Just vinegar. Simple. Lovely. So if you have a head of cabbage just sitting on your kitchen counter. Use it. And if not, this is worth going out and getting one. 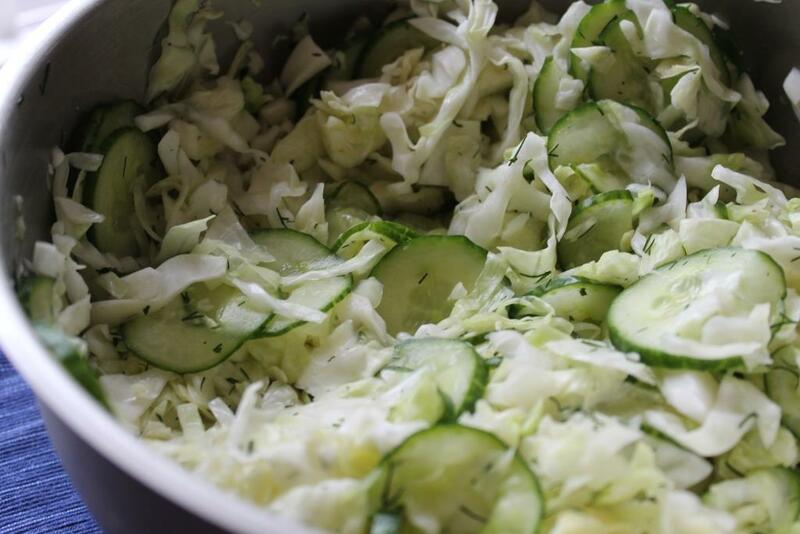 Toss the cabbage, cucumber, and dill together in a large bowl. Don’t be freaked out by how big the salad looks; it settles as it marinates. Whisk the vinegar, salt, and sugar together in a small bowl until the salt and sugar dissolve. Stir in the water. Pour the liquid over the salad, and let it marinate, tossing the cabbage occasionally. After 1 hour, it should be a bit wilted and crunchy; at 2 hours, the flavor is even better. I know normally on these posts I talk about how this month flew by...blah, blah, blah. I cannot believe it. Where does the time go? However in August that is not the case. August I like to fly by because then it is September. And September is my birthday month. I love September. Of course before August can official end I need to complete the secret recipe club post. This month for the secret recipe club I had Burnt Apple. I chose to make Honey Lime Chicken. It was hard to pass up on the baked churros. I know I will be making them soon. But this chicken dish screamed summer to me. So Mr. J manned up on the grill and off we went. The marinade was very easy to whip up. And I had all of the ingredients right in my pantry. You cannot get much better than that for a recipe. I got everything mixed up in the morning and the chicken had all day to soak up all of the flavors. Boy did they ever. Each bite had a hint of lime, honey, and a tiny kick of hotness from the cayenne. Not too sweet. Not too spicy. While the grill was on we added some ears of corn. We also had some Cole slaw on hand. Everything together made one fine meal. I could easily see this chicken paring with so many different options. A sign of a truly good chicken recipe. So that was dinner. And now I can say Buh-bye August! In a bowl, mix together the marinade ingredients. Reserve 6 Tbsp of the mixture in a small bowl and cover. With a fork, make several piercings in the meat of the chicken on both sides. Place the chicken breasts and the marinade into a ziploc bag. Seal. Move bag back and forth several times to coat the chicken completely in the marinade. Place on a plate in the refrigerator overnight, rotating bag once or twice to evenly distribute the marinade. When ready to cook, heat a grill to medium. Place chicken breasts on it and cook for 3-4 minutes each side until chicken is no longer pink in the center. Remove from heat and serve. Serve with 1-2 tsp of the reserved marinade if desired. Buying a house is hard. They cost a boat load of money. We are in the in between phase now. We are all set to get the house. We just don't have the house yet. Wait. Wait. Wait. I am not a patient person. This is hard for me. To help with the situation, my in-laws came down for a visit. Walks on the coast. Ice cream. Yummy dinners. All great distractions. Happy Friday! I am so excited for the weekend. The weather is suppose to be gorgeous. Sunny. Cool. Perfect. Mr. J's parents are visiting. I am ready to relax and have fun. To jump start the festivities I made some cookies. Chocolate chip cookies. To amp up the fun I added some Rolos. These are best served warm with the caramel oozing out and a big glass of milk. Here is to Friday! Drop chocolate chips and Rolos in and incorporate them without breaking them. Press plastic wrap against dough and refrigerate for 24 hours. When ready to bake, preheat oven to 350 degrees. Line a baking sheet with a nonstick baking mat. Set aside. Make 24 equal, size balls with the dough, about 3 Tbsp of dough each. Sprinkle lightly with sea salt and bake until golden brown but still soft, 15 to 18 minutes. Hello lovelies! I have a special treat for you today with the Pass the Cook Book Club posting. Cheddar Swirl Breakfast Buns! Each month Kita from Pass the Sushi picks a cookbook from her shelf that hasn't been used in a while. We then pick one of three recipes to make. For August the cook book was The Smitten Kitchen by Deb Pearlman. I actually have this cookbook. I got it from Mr. J at Christmas. However, I haven't made any of the three recipes that Kita chose. I really wanted to check out the s'mores cake but I couldn't see Mr. J eating more than one slice. And although I would have loved to indulge in a whole cake by myself, I was pretty sure my tummy would hate me. The Cheddar Swirl Breakfast Buns also sounded fabulous and much more doable for the two of us. Now this recipe is lengthy. It was more of a weekend project than a fast throw together dish but hey that is what weekends are for right? I made two pans of six. We baked one off and promptly finished the whole thing. The other pan went into the freezer to have for this upcoming weekend. Combine the flour, salt, pepper, and sugar in the bottom of a large bowl. In a separate bowl, whisk the yeast into the milk until it dissolves, then pour the yeast-milk mixture and melted butter into the flour, and mix them together with the paddle of an electric mixer. Switch to the dough hook, and knead on low about 6 minutes, or until smooth and slightly sticky ball has formed. Place the dough in a lightly oiled bowl, cover with plastic wrap. Let it rest until doubled in size, about 2 hours. Alternatively, you could chill the dough at this point over night, up to 3 days, then bring it back to room temp and pick up where you left off. Form the buns. Scoop the dough out of the bowl onto well-floured counter, and roll into a 12x16 rectangle. Mix filling ingredients and spread over the rectangle, leaving a ½ border at the short ends. Roll tightly and from one short end to another, making a 12” log. With a sharp serrated knife, carefully cut into 12 1” rounds. Using parchment paper, line the bottom of two small pans, 9” rounds or 8” square, or one 9x13 baking pan, and arrange 6 rolls in each of the smaller pans or all 12 in the larger, with an even amount of space in between. Brush tops with additional melted butter, cover pans with plastic wrap, and let rise at room temp until doubled again, 2 hours. When almost doubled, preheat oven to 350 degrees F.
Once buns have fully doubled, bake for 20 – 25 minutes, until tops are golden and cheese is bubbling from the center. Serve immediately. I am now very used to fresh fruits and veggies. I hope it never goes away. The hot weather however, I would gladly say good riddance. I think I always want the best of both worlds. A girl can dream right? I had grand plans for pancakes this weekend. I finally made these but the morning I was planning on whipping them up, Mr. J tempted me with this delicious breakfast sandwich. Cream cheese, fried egg, bacon, and avocado. The other thing I am currently obsessing over is chunky salsa/salad. This mix includes grilled corn, tomatoes, green peppers, avocado, and one hot pepper. No dressing needed. I would be content with just that but Mr. J needed a meat. Enter the chicken sausage. Dinner was a classic grilled meal. Marinaded chicken, grilled corn and vinegar Cole slaw. Can you think of a meal that screams summer more than this one? Breakfast for dinner takes on a whole new meaning when you add cornmeal to pancakes. I was in a major mood for blueberries this weekend. 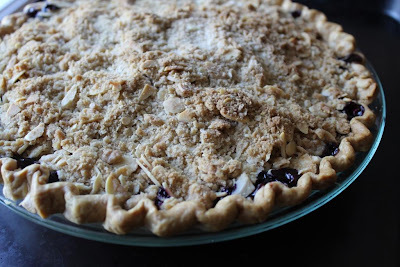 In case you missed it we also had some amazing blueberry crumb pie. When Sunday rolled around, pancakes were on my mind. In high school I worked at a bakery that served breakfast and lunch. The pancake mix we made had cornmeal in it. There is something about the cornmeal that adds something wonderful to pancakes. The grainy texture plays in your mouth and the flavor adds another level of sweetness. Topped with maple syrup, these pancakes are one great meal. I got so excited I served myself up two massive pancakes. I only ate half before I called Mr. J over to help me finish. After his first bite he was a bit mad at himself for turning down the offer of pancakes for his meal. In a medium bowl, whisk together flour, cornmeal, sugar, the baking powder, salt, and baking soda. In another bowl, whisk together yogurt, milk, butter, and egg. Combine wet ingredients into dry ingredients until just the batter just comes together (mixture will be lumpy). Fold in blueberries. Heat a griddle or large nonstick skillet over medium heat. Brush griddle with melted butter. Spoon batter onto griddle 1/3 cup at a time. Cook until edges are set, 3 to 4 minutes. Flip, and cook until golden brown, about 2 minutes. Repeat with remaining batter and blueberries, adding more butter to griddle and keeping prepared pancakes warm on a baking sheet in the oven. One of my favorite things about summertime is the fresh berries. I don't tend to bake with them too often as I have trouble not finishing off the container whole once I start snacking. This past weekend we were invited over to some friend's house for dinner. I gladly volunteered to bring dessert. We were going to the beach and it seems more fitting to have a fruit filled dessert than a chocolate dessert. Yes, it pains me to say this. When I threw out the idea of blueberry pie, everyone quickly responded with an approving nod. To sweeten the deal a bit I added a bit of white chocolate chips on top of the fruit and then used a crumb topping. Crumb topping always make pie more appetizing for me. I used a store bought crust which makes this pie recipe so simple and quick to put together. I was a little a lot nervous bringing this pie to dinner to share without being able to taste test it first. I should have known better than to test a new recipe out when sharing with others. However it got raving reviews. We served it with plain old vanilla ice cream. This was all that was left after the four of us went to town. Just enough to serve as breakfast. Happy Monday! Unroll pie crust and place in a 9” pie plate. Crimp edges as desired. Chill until ready to fill. Make the crumble by combining the almonds, brown sugar, flour, rolled oats, cinnamon and salt in a large bowl. Use a pastry cutter to cut in the butter until the mixture forms small crumbs. Set aside. Place blueberries in a large bowl. Toss gently with sugar, spices, lemon juice, and 3 tablespoons of flour. Remove crust from the refrigerator and fill with berries. Top with white chocolate chips. Pour the crumble over the top and press down slightly. Place the pie on a cookie sheet to prevent over-spilling onto your oven floor. Bake for 50 minutes. It’s done when the crust and the topping is browned. There should also be some signs of the blueberry juice bubbling through the crumb topping. Cool completely before slicing.